In a skillet, bring the wine, fish stock and shallot to a boil. Add the scallops in a single layer and simmer over moderate heat, turning once, until cooked through, about 5 minutes. 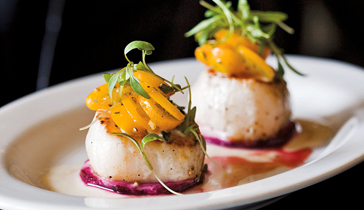 Transfer the scallops to a plate and keep warm. Bring 1/2 cup of the poaching liquid to a boil in a saucepan. Whisk in the dissolved arrowroot and cook over moderate heat until slightly thickened. Remove from the heat, whisk in the oil and vinegar and season with salt and pepper. In a large pot of boiling salted water, cook the green beans just until tender, about 6 minutes. Drain. Spread the beans on 4 plates. Thickly slice the scallops and set them on the beans. Drizzle with the vinaigrette, garnish with the tomato and tarragon and serve. One Serving Calories 241 kcal, Total Fat 11.6 gm, Saturated Fat 1.6 gm. A California Sauvignon Blanc will balance the vinaigrette's bite.